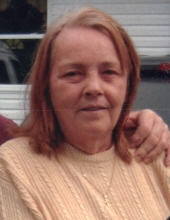 Nancy Jane Mullins Lester, 71 years of age of Jolo, WV, passed away Tuesday, March 19, 2019 in Pikeville Medical Hospital. Born December 18, 1947 in Jolo, WV, she was the daughter of the late Mack Mullins and Mae Brewster Mullins. Nancy enjoyed yard selling, spending time with her family and was of the Christian faith. A loving wife, mother, grandmother and sister. In addition to her parents, she was preceded in death by her sister Lou Bell Webb and brothers Ira, Fred, Mackie and Raymond Mullins. Survivors include her loving husband of forty-nine years Bill Ray Lester of Jolo, WV; daughters Kippi Ann Lester and Donna Marie McGraw both of Jolo, WV; sisters Sylvia Vogel of FL, Mona Jean Kennedy of Jolo, WV; brother Shelby Mullins of Jolo, WV. She is also survived by her grandchildren Haley McGraw, Hunter McGraw, Erica Lester and husband John Justice; great-grandchildren Ryder Justice and Raidon Justice; several nieces and nephews. Funeral service for Nancy Jane Mullins Lester will be held at the Crossview Church Of Christ at Paynesville, WV, Saturday, March 23, 2019 at 12:00 noon with Evangelist Hobert Kennedy officiating. Burial will follow in the Lester Cemetery on Panther Ridge Road, Grundy, VA. The family will receive friends at the Crossview Church Of Christ, Friday, March 22nd after 6:00 p.m. with evening service to be held at 7:00 p.m. The family of Nancy Jane Mullins Lester have entrusted the care of their loved one to Shortridge-Ramey Funeral Home of Grundy, VA.
"Email Address" would like to share the life celebration of Nancy Jane Mullins Lester. Click on the "link" to go to share a favorite memory or leave a condolence message for the family.